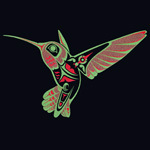 Dakdakiiyaa (Hummingbird) is a member of the Trochilidae Clan and in Northwest Coast imagery is recognizable by its long slender beak and outspread wings, ready for flight. This latter characteristic emphasizes its unique ability to fly in any direction. Indeed, this phenomenon, signaled by a musical buzz, iridescent flash and blur, facilitates its supernatural travel between human world and spirit world. In this depiction, sheltering under its mother's wing, is a naked hatchling with mouth agape in expectation of a sweet meal. This repast of nectar has been gathered from the throats of hundreds... thousands of flowers, then whisked to the nest at the forest edge; a home insulated with moss, lichen, down and spider webs. Once, the traditional order of Haida matrilineal succession was jeopardized by the capture of a high born Haida Eagle Clan woman at Lax Kw'alaams (Port Simpson). 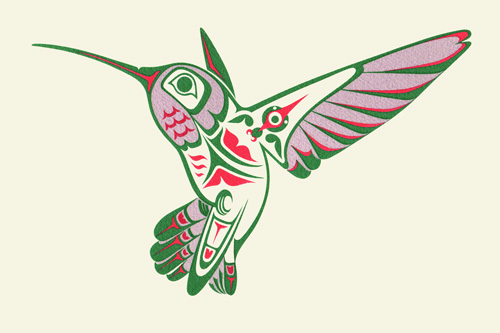 This order was restored by the delivery of her children home to Haida Gwaii with the gift of the Hummingbird as a new family crest. To order please contact us and we'd be happy to assist you! 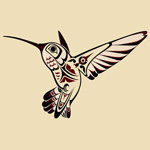 Image Size 7.5" x 11"